Five students from the Diocese of Brooklyn and Queens were selected for a once-in-a-lifetime chance to greet Pope Francis after his landing at the John F. Kennedy Airport on Thursday, Sept. 24. The children were selected through the offices of the Superintendent of Catholic Schools and the Vicar of Development to show the diversity of cultures in the diocese. 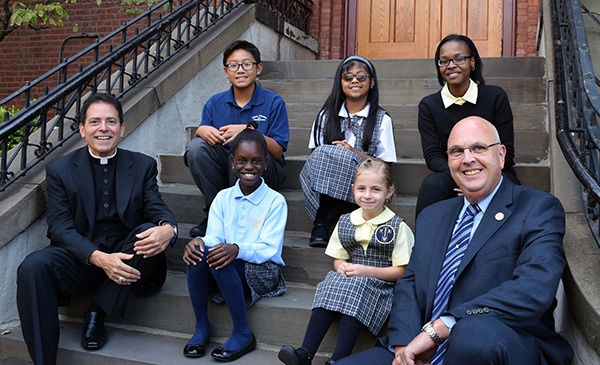 A few days before the pope’s arrival, the five children – and their parents – said they were ecstatic to join Brooklyn Bishop Nicholas DiMarzio in welcoming the pope to New York. “I feel excited and joyful,” said Brianna Wood, a fourth grader from St. Rose of Lima Catholic Academy, Rockaway Beach. The Wood family has been praying for Pope Francis at night and talking about his trip to the U.S.
“I think for the children it’s a memorable life moment, they’ll never forget it,” said Bishop DiMarzio. During the welcome ceremony, the students were set to give the pope a spiritual bouquet made out of prayers from students from the 86 schools in Brooklyn and Queens. “The spiritual bouquet is a collection of the prayers and good works that the children are doing in all of our Catholic schools,” said John Heyer II, development officer at Futures in Education, which supports Catholic education in the Diocese of Brooklyn. Msgr. Jamie Gigantiello, vicar of development, said the prayers the students were presenting included intentions for the World Meeting of Families taking place in Philadelphia and for the rest of Pope Francis’ apostolic visit to the United States. Christina Desanges, a 10th grader at Cristo Rey Brooklyn H.S., Flatbush, said she was shocked and almost didn’t believe it when her mother received the phone call from the diocese to inform her of her role in welcoming the pope. She said she wanted Pope Francis to know that people in Brooklyn and Queens are praying for him, as he continuously asks. Like Desanges, Raymond Rico, a seventh grader from Divine Wisdom Catholic Academy, Bayside, hoped that the pope’s visit had a positive impact on New Yorkers. “It is very great that he is coming and I’m very excited,” said her daughter Maria Teresa, a first grader at St. Joseph the Worker Catholic Academy, Park Slope. Though some of the children were too young to fully grasp the message of “understanding, love and prayer” that Pope Francis brings, they could not wait for his apostolic visit. Her mother Ranti Ojo said to see the pope personally was a gift.